Zone 3. Perhaps the hardiest of all thymes. Edging. rock gardens. ground cover. Not particularly good for cooking. Easy. Can be pruned or mowed to keep tidy. Great along walkways or between pavers. Can be walked on. Although related to the common thyme used for cooking, Creeping Thyme (also called Mother of Thyme), is not as flavorful and not recommended for culinary purposes. It is, however, wonderfully fragrant and makes an outstanding ground cover. It grows flat along the surface of the ground. From early to midsummer it sends up masses of small pinkish purple flowers. Creeping thyme spreads readily in full sun but is not difficult to keep in check because of its shallow roots - simply pull back where it is not wanted. 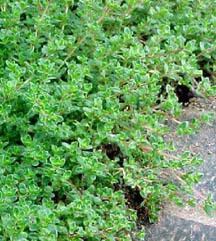 Creeping Thyme is attractive in rock gardens, on banks, or placed between stones in a flag stone walk. If a ground cover effect is wanted, the area should be thoroughly weeded before placing plants as trying to remove large weeds later is difficult and the thyme may be uprooted in the process. Division is not necessary but can be used as a means of increase. If plants start to weaken over time, they can be rejuvenated by pruning and applying a thin layer of well-rotted compost.